Arthur Babiarz, a graphic designer by education, designed the website for this project. His offer of assistance was spontaneously welcomed and his contribution enthusiastically appreciated by the committee. He worked directly with Anna Wojciechowska on the website content and advised on various technical issues in relation to other aspects the website. Maria Daszkiewicz, a psychiatrist and the author of "Listening to Dawn", the story about the last sculpture of the artist. She was the coordinator for the project’s progress. Maria was responsible for keeping records of meetings and contributed financially to some of the project expenses. Ewa Izdebska, Historian of Fine Arts, former manager of the Gallery “Art” in Warsaw, Poland – where Ryszard Wojciechowski exhibited his works. She was an advisor on the content of the page, selection of photographs and overall artistic appearance. Roman Izdebski, Associate Professor at the Emily Carr University of Art and Design, Vancouver and former Assistant Professor at the Academy of Fine Arts in Warsaw, Poland. He was responsible for art direction on the artist’s web site including selection of photographs and scanning. Anna Jung Wojciechowska, a sculptress herself, was also the wife of Ryszard Wojciechowski. Her essay on Ryszard and other texts are included on the Website. Her supply of material for the Website has been indispensable. 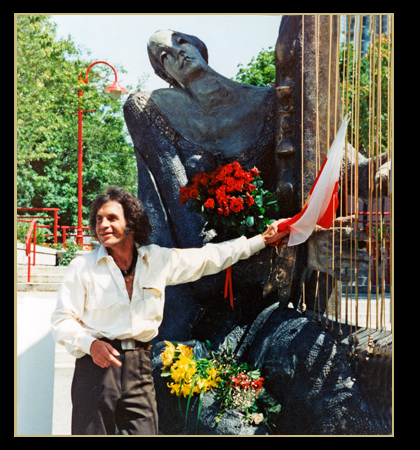 Anna organized gatherings and presentations in both Poland and Vancouver to memorialize Ryszard’s legacy. She has been the liaison for communication and organization, especially with the Consulate General of the Republic of Poland.